The MC-25 is Pageantry Innovations’ larger double mixer cart. It is a little bigger than the MC-20 but not as large as the MC-30. It has a 1.5 in. square tube accessory bar and foamed shelf that stands 36 in. from the ground and measures 22 x 43 in. 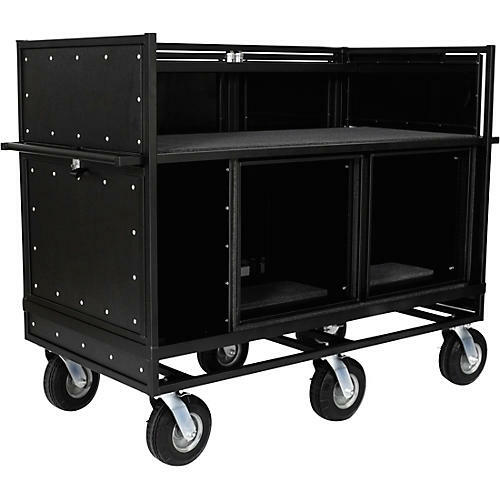 All of Pageantry Innovations’ mixer carts have removable top and rear covers as well as front hinged doors that open and allow for easy wiring. Also, the MC-25 has 20 free-floating spaces. The biggest differences between the MC-20 and the MC-25 model is, well, that it's extended. The foamed shelf is 22 x 54.75 in. or 11.75 inches longer than the MC-20. The MC-25 has a full-panel access door and dedicated snake storage. There are also two full-depth 10U racks below the shelf. And, of course, you get eight internal outlets (linked to one power inlet) and two Speakon NL4 jacks linked to four Speakon NL2 internal cables. (W x H x D) 48 1/2 x 62 3/4 x 30 in.